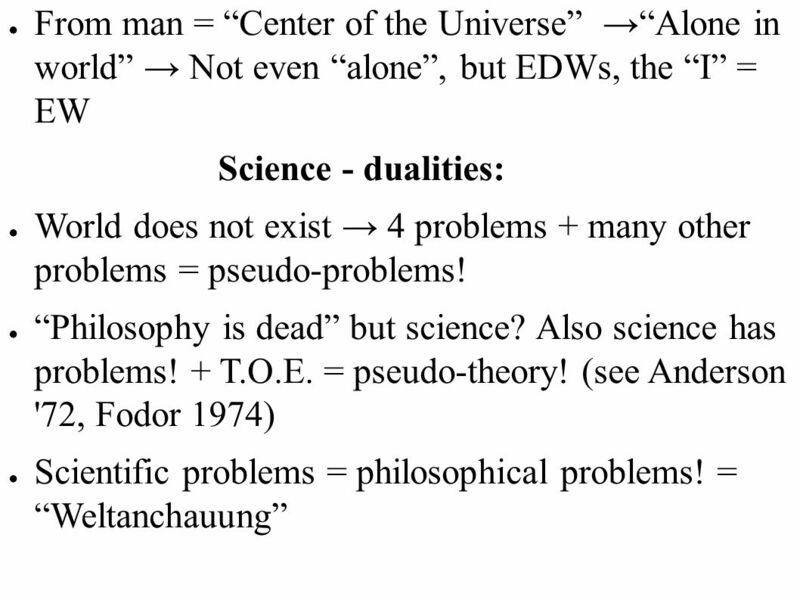 Scientific knowledge 4 problems of the "world" (dualities): 1. mind-body (brain) [Cognitive Science] 2. cell/organism-life [Biology] 3. particle-wave (quantum) [Physics] 4. micro-macro (Einstein-quantum mech.) 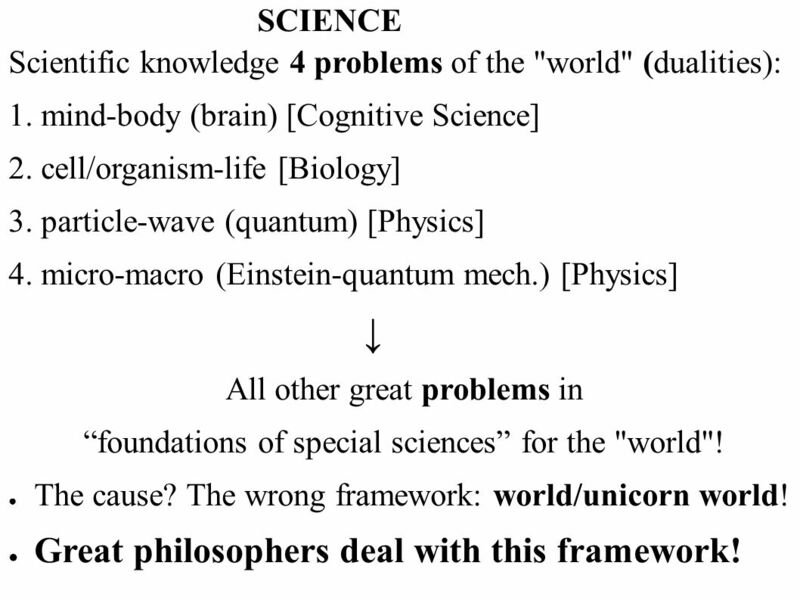 [Physics] ↓ All other great problems in “foundations of special sciences” for the "world"! The cause? 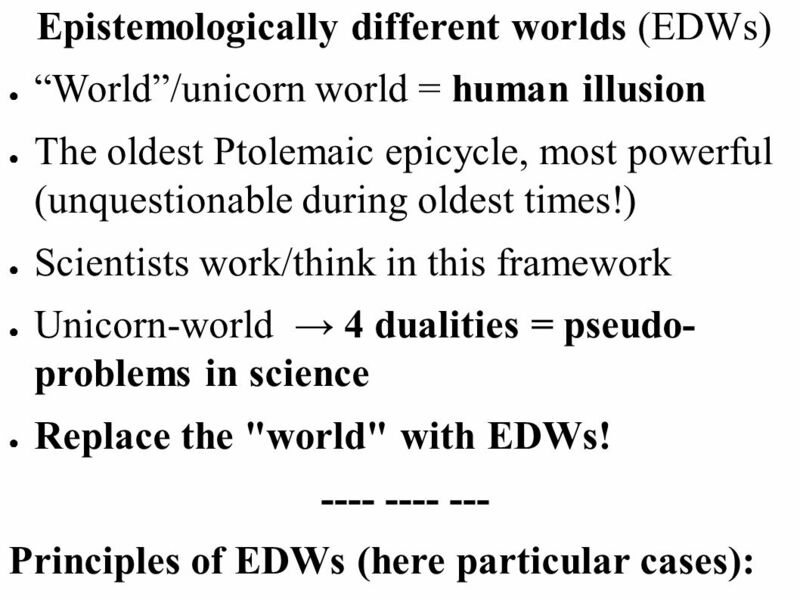 The wrong framework: world/unicorn world! Great philosophers deal with this framework! 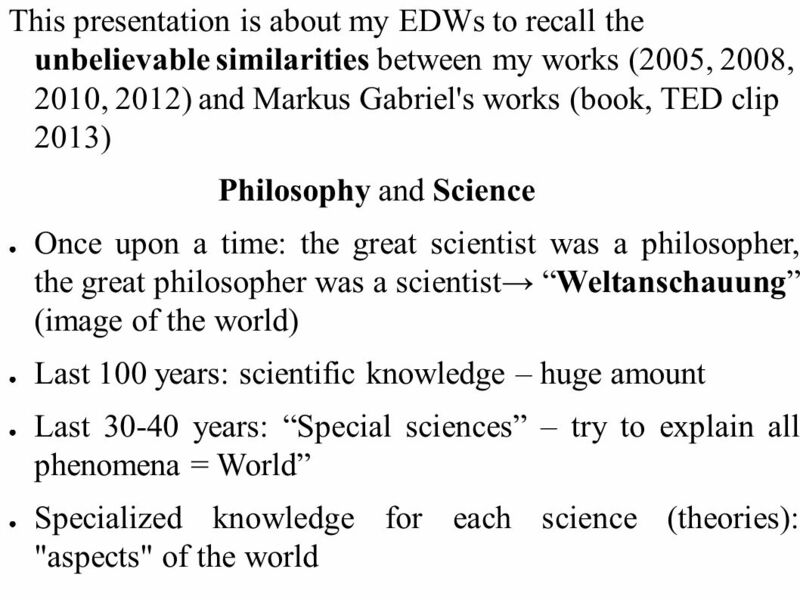 (1) Epistemologically different interactions constitute epistemologically different entities, and epistemologically different entities determine epistemologically different interactions. (2) Any entity exists only at "the surface" because of interactions that constitute it. 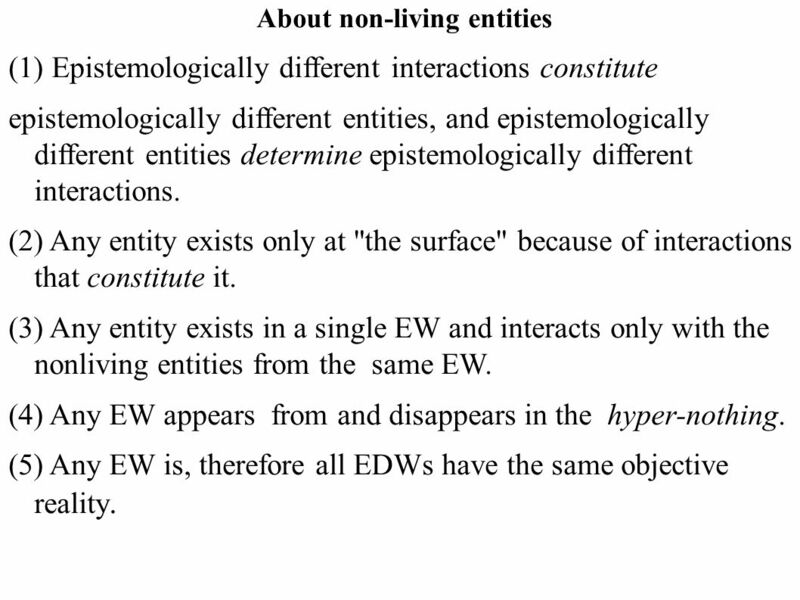 (3) Any entity exists in a single EW and interacts only with the nonliving entities from the same EW. (4) Any EW appears from and disappears in the hyper-nothing. 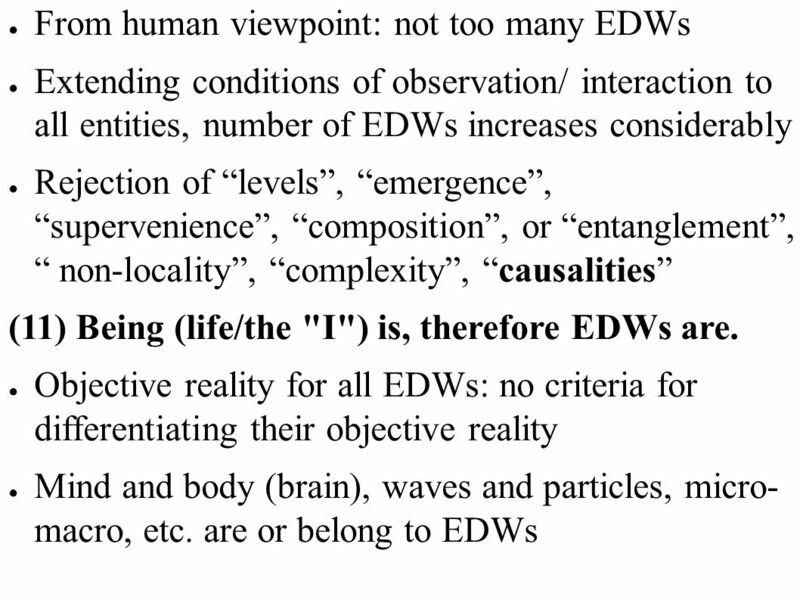 (5) Any EW is, therefore all EDWs have the same objective reality. 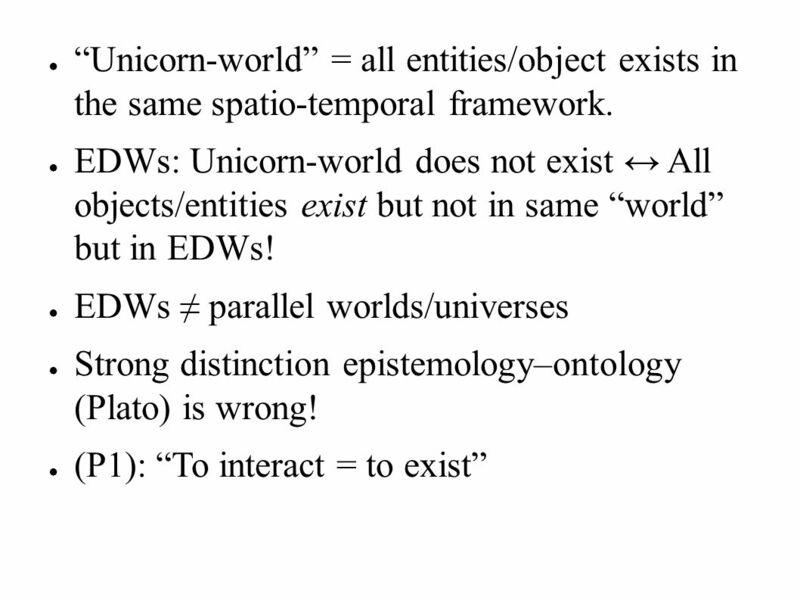 7 “Unicorn-world” = all entities/object exists in the same spatio-temporal framework. 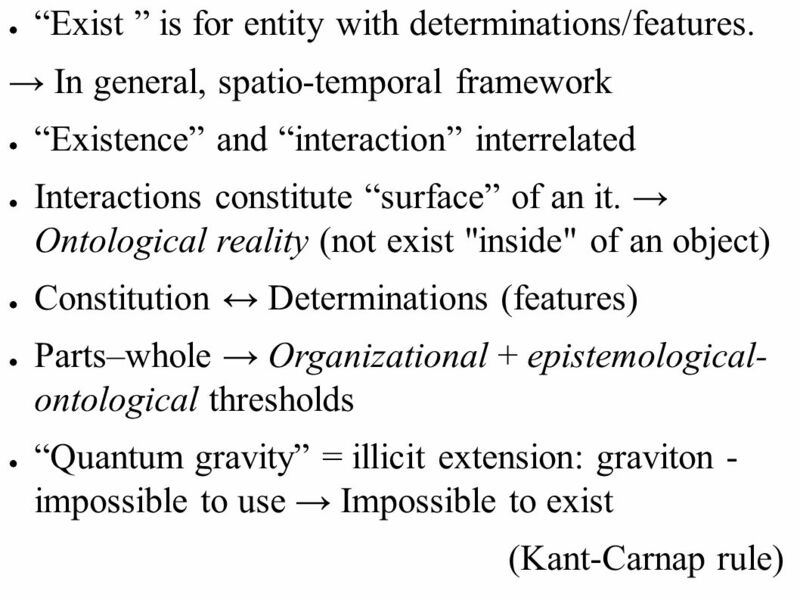 8 “Exist ” is for entity with determinations/features. 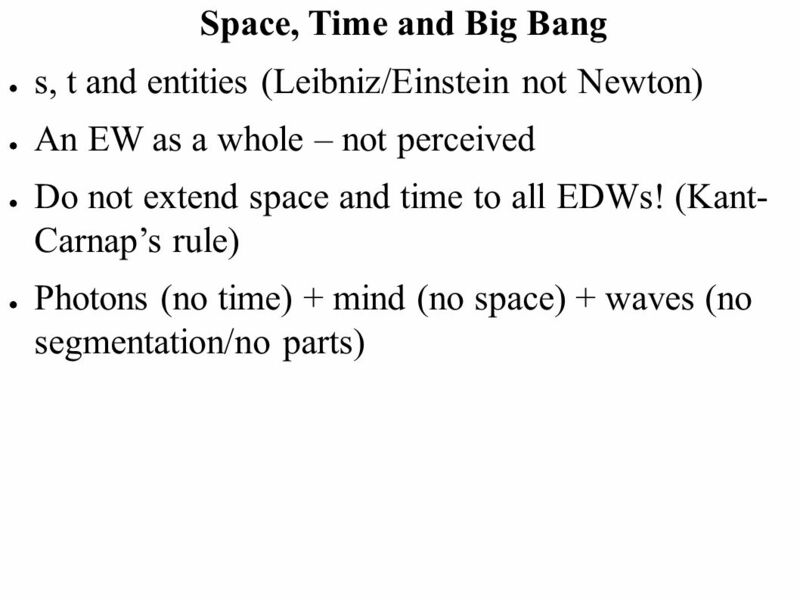 10 “Before” Big Bang, another EW, and another, avoid regress ∞: one EW no space and time (maybe that EW still is) Causality/relation between mind-brain or table- microparticles? Meaningless question! (Even identity is wrong!) 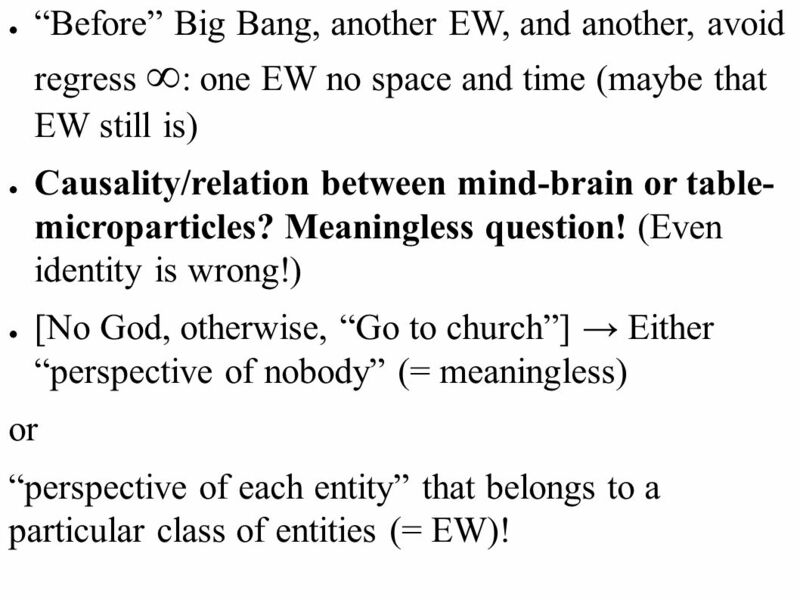 [No God, otherwise, “Go to church”] → Either “perspective of nobody” (= meaningless) or “perspective of each entity” that belongs to a particular class of entities (= EW)! 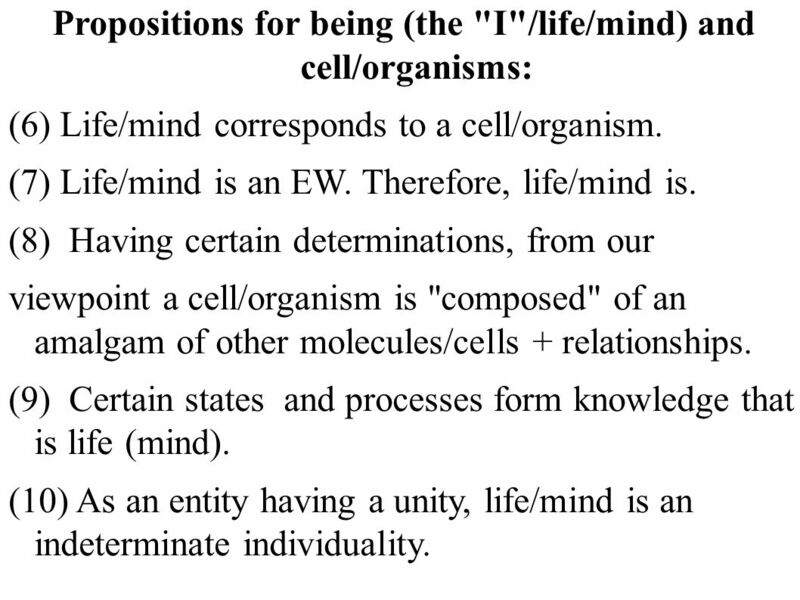 (6) Life/mind corresponds to a cell/organism. (7) Life/mind is an EW. Therefore, life/mind is. (8) Having certain determinations, from our viewpoint a cell/organism is "composed" of an amalgam of other molecules/cells + relationships. 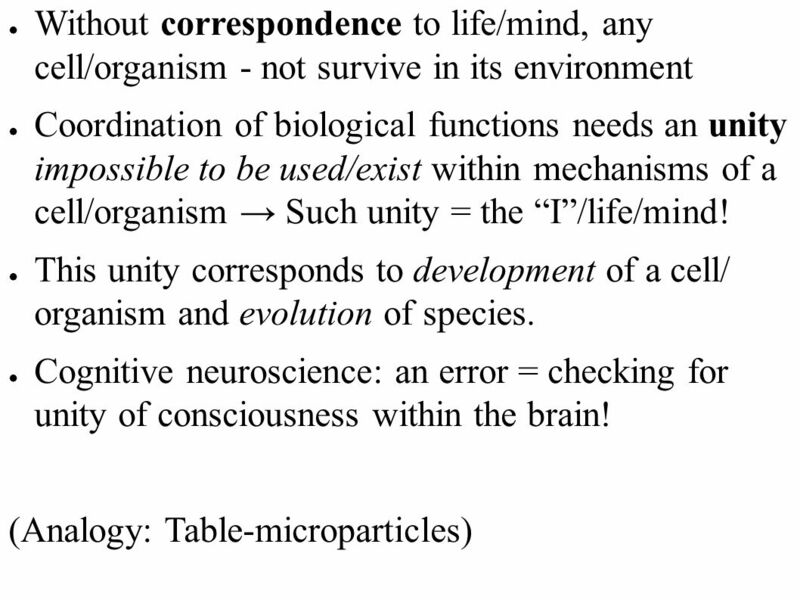 (9) Certain states and processes form knowledge that is life (mind). (10) As an entity having a unity, life/mind is an indeterminate individuality. 13 The unity of the “I” represents indeterminate individuality of life/mind. 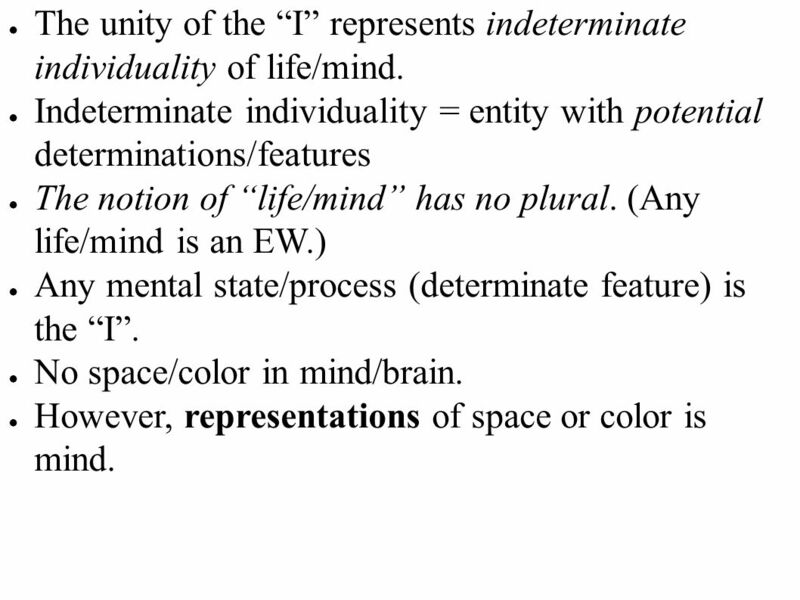 Indeterminate individuality = entity with potential determinations/features The notion of “life/mind” has no plural. (Any life/mind is an EW.) Any mental state/process (determinate feature) is the “I”. No space/color in mind/brain. However, representations of space or color is mind. 14 Without space (only “virtual s” = representation of s) → Life/mind = indeterminate individuality with its unity. This unity cannot be identify using any tools of observation. 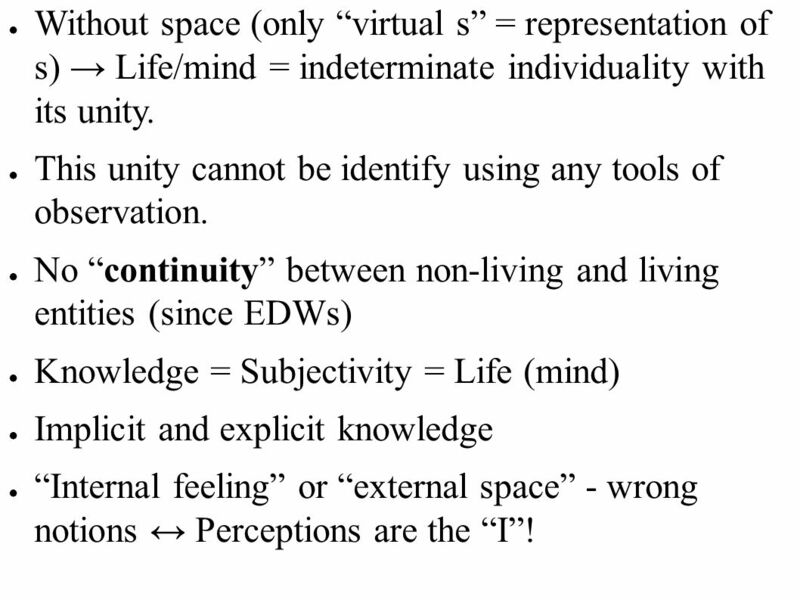 No “continuity” between non-living and living entities (since EDWs) Knowledge = Subjectivity = Life (mind) Implicit and explicit knowledge “Internal feeling” or “external space” - wrong notions ↔ Perceptions are the “I”! 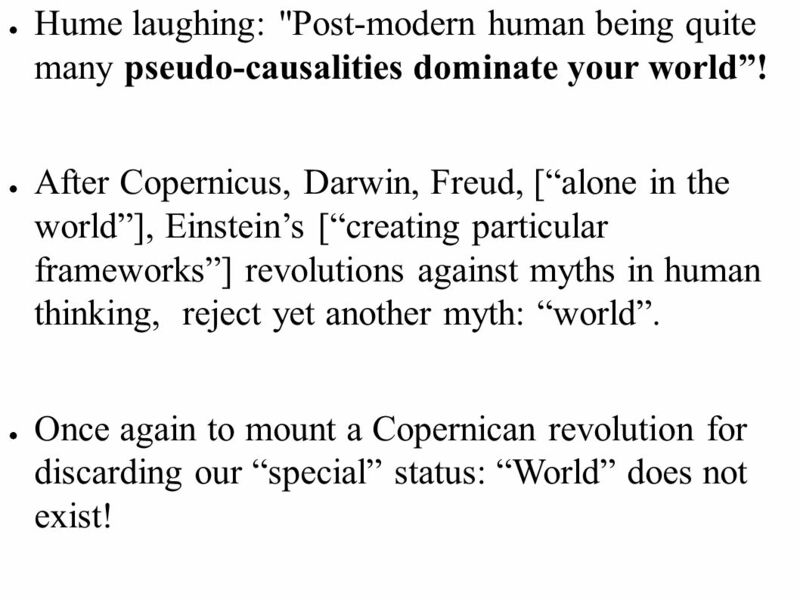 16 Hume laughing: "Post-modern human being quite many pseudo-causalities dominate your world”! 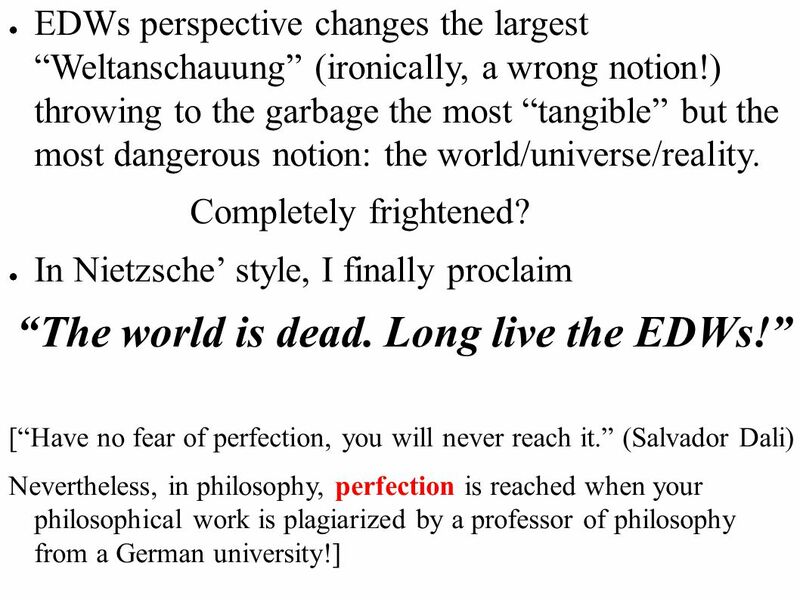 After Copernicus, Darwin, Freud, [“alone in the world”], Einstein’s [“creating particular frameworks”] revolutions against myths in human thinking, reject yet another myth: “world”. Once again to mount a Copernican revolution for discarding our “special” status: “World” does not exist! 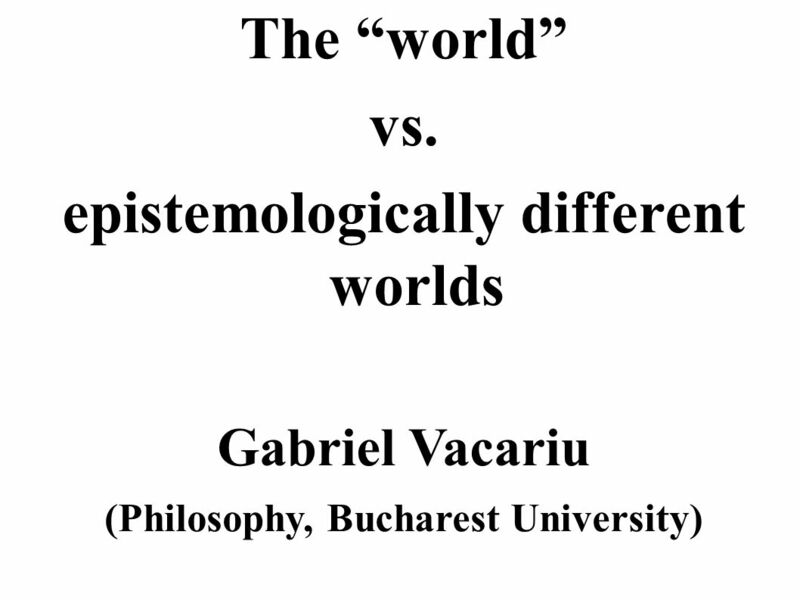 Download ppt "epistemologically different worlds (Philosophy, Bucharest University)"
Introduction: The main problem: the mind-body (brain) problem Philosophy of mind: Descartes’ dualism, identity theory (Place and Smart), eliminativism.  French philosopher, mathematician and physical scientist (optics, physics, physiology)  Father of Early Modern Rationalist Philosophy  Early Modern. Hume on Taste Hume's account of judgments of taste parallels his discussion of judgments or moral right and wrong.  Both accounts use the internal/external. 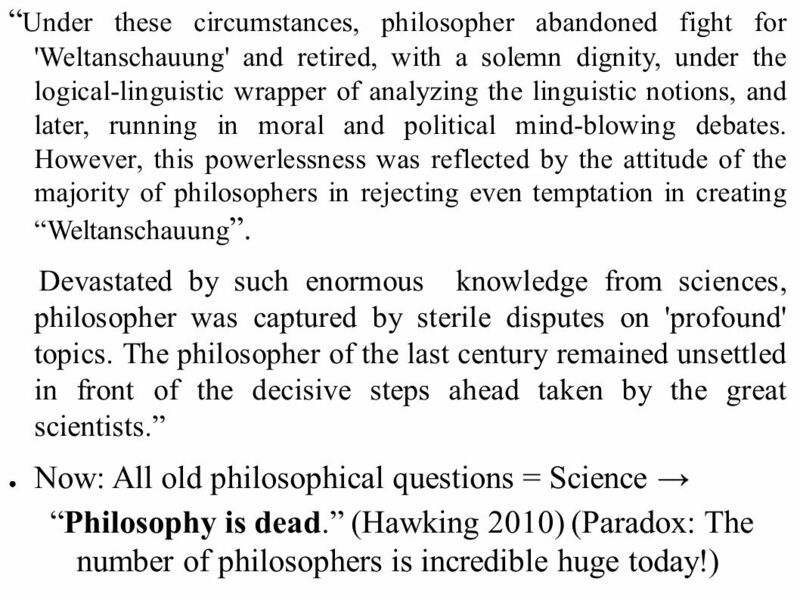 Introduction to Cognitive Science Philosophy Nov 2005 :: Lecture #1 :: Joe Lau :: Philosophy HKU. Human Evolution Session I Matter-Universe A multidisciplinary anthropic focus. René Descartes The father of modern Western philosophy and the epistemological turn Methodological doubt, his dreaming argument and the evil.